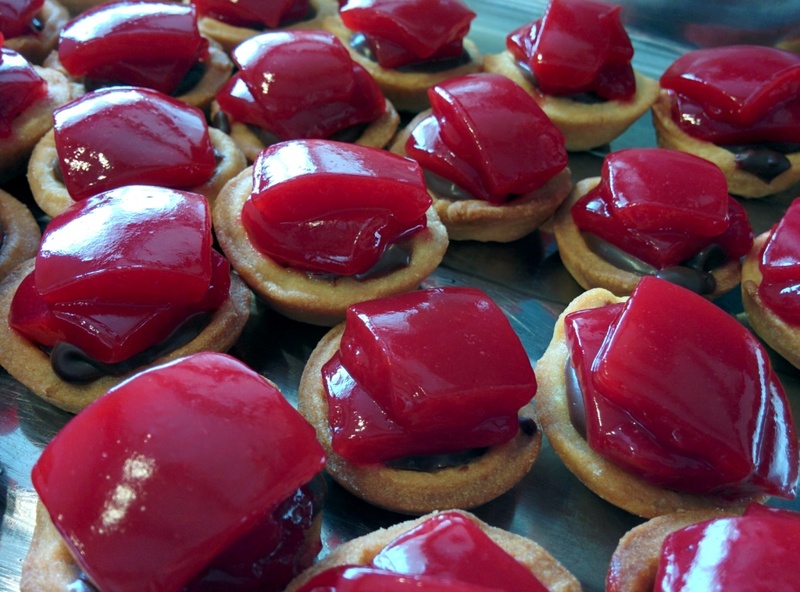 Chocolate Raspberry Tarts are little morsels of awesomeness! Topped with epic vegan raspberry jelly and filled with dairy free chocolate mousse you just have to go back for one more. Substitute the sweet short crust pastry (base) with a vegan alternative such as the base from my Chocolate Mousse Cake Recipe to make this an amazing vegan dessert. Put flour, salt and sugar into a bowl. Add margarine and rub until mixture is like breadcrumbs. Add vanilla, water and egg yolks. Mix together and knead into a soft smooth ball of dough. Place in fridge for at least 15 minutes. Roll out pastry to about 2-3mm thickness. Cut circles out of the pastry to line the holes in a mini-muffin tray. Bake blind for 8 minutes. Remove baking blind material and bake for 1 minute. Remove from oven tray and set aside to cool. Continue to bake pastry cups until pastry is used up. Place tofu and vanilla essence into a blender or food processor. Over a double boiler, melt chocolate. Add melted chocolate to blender and quickly start whizzing the mixture until smooth. Spoon into the cooled bases. Place into fridge for at least 2 hours or until set. Put raspberries and water into a small saucepan. Mash the raspberries into the water with a fork. Add agar agar powder and simmer for 5 minutes. Remove from heat. Place a non-stick silicon mat into a large flat bottomed tray (such as a swiss roll tin). Pour raspberry jelly mixture onto mat and refrigerate overnight or until set. Cut small shapes from the jelly and layer over the set chocolate tarts - I used a square cutter and two jelly layers to give the tarts some height. - I don't have a double boiler so to melt the chocolate I use a glass or metal bowl on top of a saucepan of boiling water - just need to be careful of the steam, I often wear an oven glove on the hand holding the bowl. - You can also use a microwave to melt the chocolate by microwaving in stints of no more than 20 seconds at a time (often much less once heated through), stirring in between each stint. - Make sure you start whizzing the filling mixture as soon as the melted chocolate has been added because the chocolate will start cooling and solidifying as soon as you add it.